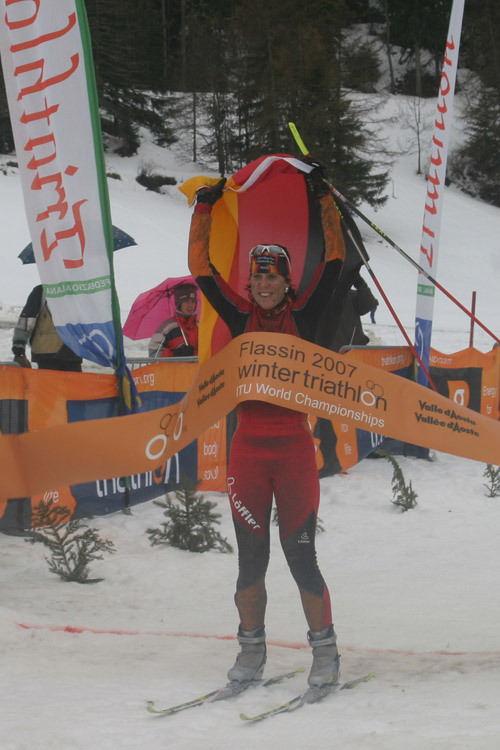 Sigrid Mutscheller of Germany and Arne Post of Norway are the 2007 ITU Winter Triathlon World Champions. The two athletes ran, cycled and skied their way to victory in less than perfect race conditions in Flassin-Saint Oyen, Italy today. Mutscheller continues her dominance of the sport taking her fifth world championship title, and fourth in a row, in a time of 1:53:24. Austrian Carina Wasle finished second, 2 minutes and 38 seconds back with a time of 1:56:02. Local Italian favourite, Michela Benzoni finished third a further 22 seconds back with a time 1:56:24. I am really happy with the result, stated the nine-time world championship medallist, Mutscheller. The course was extremely hard and long. I felt on the bike the first time that I will win and my goal for next year to win the World Championships in my home town, Freudenstadt. That would be the sixth. Wasle took an early lead on the muddy seven kilometre run course with her team mate Marlies Penker with her. The two Austrian managed to put almost 90 seconds between themselves and the days top contenders by the time everyone quickly transitioned to the 12 kilometre cycle course. Because of heavy rainfall, however, the course was muddy and slick, enabling the more experienced riders to close the gap by the second transition. First onto the 10 kilometre cross-country ski course was race-favourite Mutscheller who never looked back as she led the entire ski segment to cross the line first, with the fastest ski split of the day. In the mens event, world number one ranked, Post was able to claim gold in the largest-ever mens field at a world championships with a time of 1:38:05. Forty seconds behind in the silver medal position was two-time world champion Sigi Bauer of Austria with a time of 1:38:45. 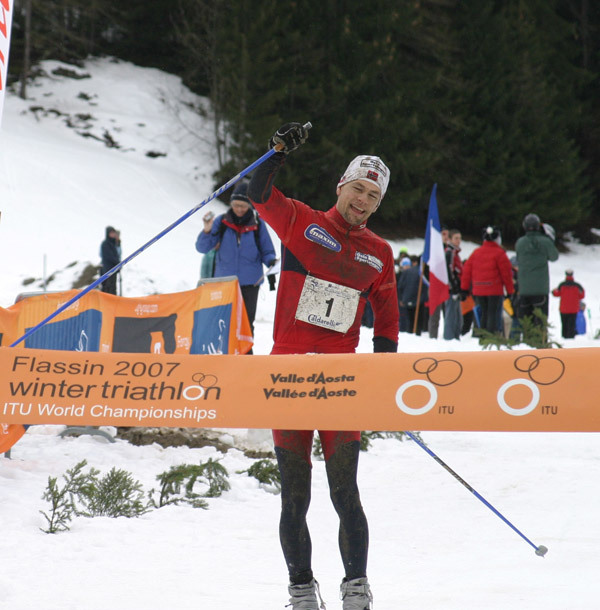 A further 31 seconds back was another two-time world champion, Nicolas LeBrun of France, with the bronze medal. I like the number one, since I started with this race number, said world cup points leader, Post. It put at the same time some pressure on me. The course was hard, but it was the same for everyone. This was the best ever season for me. After the opening 2-lap run leg, a large group of men entered the first transition, including eventual podium finishers Post and LeBrun. Bauer started the 3-lap cycle leg 90 seconds back of lead group but managed to pull himself up by the start of the cross-country ski. It became clear at this point that the Norwegian ski-specialist Post was at a clear advantage, taking off over the first of three laps, never to look back. Bauer and LeBrun fought hard over the 10 kilometre course but Bauer managed to pull away at the halfway mark, maintaining his lead to the finish. In the Under23 races, the winners were Germaine Roullet from Italy in the women and Konstantin Lavrentyev from Russia in the men. In the Junior events, gold went to Norwegian Tuva Toftdahl in the womens field and Nicholas Jeantet of Italy in the mens field. Tomorrows competition will feature 250 Age Group competitors from 23 countries and the Elite Team races. Arne Post (NOR) wins in impressive fashion. Sigrid Mutscheller (GER) asserts her dominance of the sport of winter triathlon.